The electron is a spherical standing wave system. Surprisingly, spherical standing waves can move, thanks to the Doppler effect. Then they are not "standing" any more. The phrase "standing waves" is misleading because such waves can move. Then each wavefront remains perfectly spherical in spite of the Doppler effect. However, the system's nodes and antinodes undergo a contraction according to the Lorentz transformations. It is clearly visible in the animation shown above. The most ignored and scorned science. I never could find any practical information about spherical standing waves, except for Milo Wolff's web site. So I had to develop the whole science by myself. It was a time consuming task, but it was worth the effort because I could explain matter and all forces. However, many people such as MM. Serge Cabala, Philippe Delmotte, Anselme Dewavrin and Jocelyn Marcotte helped me. I suppose that some pioneers did find interesting equations and properties in the past, but where are they? The wave science is the most ignored and scorned of all. This attitude is especially hard to explain because nuclear physicists know since many decades that matter exhibits wave properties. Clearly, such waves cannot be plane. They should be spherical, and more likely spherical standing waves. In addition, because matter can move, a Doppler effect should occur. This is quite obvious. So scientists should be aware that spherical standing waves explain matter, especially the electron. But they never dare to show such waves or speak about them. Firstly, one must examine the unmoving system, which is simpler. This 3-D view is interesting, albeit it is artificial. 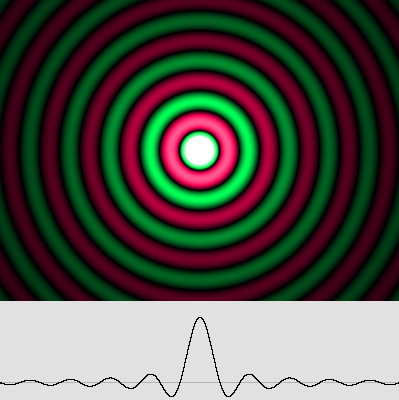 The animated diagram above displays standing waves with a 3-D effect. Standing waves on water should look like this, but electrons are actually spherical standing waves. The wave addition is rather complex. The result is an amazing full lambda wide core, where a pi phase shift occurs. The moving electron undergoes the Doppler effect. Waves are not concentric any more, but they remain perfectly spherical. The wave addition reveals a stunning "phase wave", which speed is given by: 1 / beta. The moving electron diagram (speed : .5 c), showing its characteristic envelope still present. NO INCOMING WAVES. JUST OUTGOING WAVES. I had much trouble explaining to many people that standing waves ARE NOT made of traveling waves. It is a totally different system which behaves in accordance with Hooke's law. For calculation purposes, such waves can indeed be considered as two sets of waves traveling in opposite directions. This is a very useful method for computer programs, and I used it for the diagrams shown above. However, one must observe what is really going on inside the medium substance while standing waves are present. For instance, using a loudspeaker, one can produce standing waves inside a pipe. The traveling waves penetrate inside the pipe, and while the frequency is correct, a resonance is obtained. This occurs because the pipe ends act like screens and do not permit all the energy to get out in just one pulse. Turning off the loudspeaker will not make the resonance stop immediately. Theoretically, a lossless system (no heat or energy loss) with both ends closed would continue to vibrate eternally. The air is simply compressed inside the standing waves antinodes, then the pressure energy is transferred into kinetic energy, and so on. The same process occurs for a lossless spring moving back and forth. This is Hooke's law. This means one needs incoming traveling waves in order to establish standing waves, but those waves are no longer needed once the system is well established. The electron is a pulsating wave system. For the same reason, electrons must have been created in the past using incoming waves. Such a situation is not likely to happen because aether waves have different frequencies and phases, but it is still possible. One chance out of billions and billions. However, once it has been created, the electron can remain stable because its standing waves are constantly amplified by aether waves. This can be explained by a lens effect. This means that in-phase incoming waves are not needed any more. The electron just needs constant and powerful waves incoming from any matter in the universe, which phase or wavelength may be different. Then it simply goes on vibrating and pulsating spherical waves eternally. Standing waves progressively transform to traveling waves. Far away, just outgoing spherical waves remain. The x variable is more exactly a phase delay in radians. However, this becomes inaccurate for a smaller than pi distance because the electron is a very special emitter. It exhibits a pi / 2 phase offset at the center. This Basic or FreeBasic instruction will add the pi / 2 phase offset in the center. In addition, the amplitude there will be displayed very smoothly. This wave generator bears the name of Mr. Jocelyn Marcotte, who discovered in March 2006, and demonstrated with his own 3-D Virtual Aether, that the well known sin(x) / x formula matched the electron waves. It is especially useful here because it is amazingly simple and works everywhere from the center to infinity. The Marcotte Spherical Wave Generator. Note the pi / 2 (or lambda / 4) additional expansion, which is the rule for the electron out-waves. The interference pattern created between two electrons or positrons becomes a powerful standing wave system because it is also amplified by aether waves. It is a field of force. It must be evaluated by respect to the distance, and also the spin because there are four possible phase differences in the particle center. The electrostatic "biconvex" field of force is made of hyperbolic-ellipsoidal standing waves. The structure is similar to that of the diffractive lens, so they should produce an Airy disk too. The wave phase in the center changes according to the distance and the particle spin. The pi / 2 phase offset in the center expands all the spherical waves to an additional lambda / 4 position. It is of the utmost importance because those waves encounter those incoming from another electron or positron and produce the field of force shown above. Its amplification makes it so that a very strong wave beam converges back towards electrons or positrons which caused them. I could check that such a convergent beam should produce an Airy disk, just like most convergent beams except apodized ones. One must also remember that the Airy disk is only the diffraction pattern at the focal plane. It is called the Fraunhofer diffraction (its distance is infinite for the laser), while the whole diffraction pattern anywhere else between the source and the Airy disk is called the Fresnel diffraction. The pattern is different whether the source is plane or spherical. When two electrons come very close together, their standing waves may add constructively even in the area beyond them. Then they radiate a perfect Airy disk exactly in their center. They transform into a quark with a powerful gluonic field all around them, where the forces involved are quite different. In addition, the phase in the center may be compatible with the positron's quadrature. So the whole system is no longer negative and three of them (three quarks) placed crosswise on the three Cartesian axes become a neutron, which may finally transform into a proton if a positron is captured in the center. The point is: the on-axis wave period explains how radiation pressure works. So this wave generator compatible with the electron, which is surely the most perfect spherical wave generator, will be very useful for searchers studying radiation pressure. But it will also be useful for displaying ripples on water in computer generated animations, and for a lot of other applications! One can apply the same reasoning to the 2-D Circular Wave Generator, which phase offset in the center is only pi / 4. Using the Huygens principle, and also the Virtual Aether, Mr. Marcotte and I already showed that the 2-D central antinode exhibits a 3 / 4 lambda diameter. According to the diagram below, the core amplitude is higher for standing waves, as it was also the case for spherical waves. 2-D circular standing waves, according to Huygens' Principle and the Virtual Aether. Spherical standing waves will be very useful in the future for a lot of applications. Up to now, scientists were definitely not aware that they can especially build up enormous pressures inside their central core. In addition, microwaves emitted from the inner surface or a sphere produce a similar pattern and build up huge quantities of energy focused inside a very small spherical core. And this energy is recycled if the sphere surface is metallic. The point is: this small core is the perfect place for thermonuclear fusion, because both heat and pressure are needed to transform hydrogen, deuterium and tritium into helium. Moreover, this little sphere stands far away from any solid matter, which otherwise would melt. The microwaves will produce heat, and also very strong magnetic and electric fields inside the compressed plasma. Magnetic fields correctly applied facilitate the fusion because hydrogen unpaired electron and proton behave like small magnets. Such fields are present on the sun surface, especially around sunspots. This central sphere will simply become a little sun, constantly producing heat, hence electricity. Both the acoustic and electronic (microwave) systems can coexist and achieve the very high pressure and heat requirements. Russia experimented in 1961 a 57 megaton hydrogen bomb which detonator was a plutonium bomb. This is unthinkable for producing electricity. The goal is to safely obtain the fusion temperature and pressure point. Tritium for example is a dangerous substance which must be severely controlled. In addition, the fusion process produces neutrons which make matter in the vicinity become radioactive. The moon surface contains huge quantities of helium-3, which fusion produces safer protons, but needs higher temperature. It also may directly transform energy into electricity because protons are positive. The most recent project in Cadarache, France, uses very strong magnetic fields in order to facilitate the fusion process and to isolate the plasma from any solid matter. But it still needs very high pressures and temperatures, and so I propose to add the standing wave method to it. The core can build up considerable pressures. The fifth (green) spherical layer is 5 wavelength distant to the center. The core pressure is: 5 * 2 * pi = 31 times higher than in this layer. A doubled frequency (half the wavelength) would double the pressure for the same distance. The x variable is given by: 2 * pi * distance / lambda, and so the wavelength is important. On the other hand, a bigger core should produce more heat and energy. The core pressure is normalized to 1, but the goal is to obtain the required pressure for the fusion to begin. The equation indicates which pressure should be applied on the inner side of the sphere. Obviously, the amplitude is always positive for a compressed medium because vacuum is the lower limit. An asymmetry appears for very high amplitude levels. So, before proceeding, the hydrogen overall pressure should already be very high. The device also needs a chimney for collecting heat, and a system for recycling the hydrogen. The sphere can be replaced by an ellipsoid with two focus cores, producing a sort of "artificial quark" with high amplitude plane standing waves in-between. Then those standing waves may participate to the fusion process, greatly improving the device efficiency. I presume that engineers will find a practical way to produce Huygens wavelets on the inner surface of the sphere. Technically, most of the energy produced by at least one thousand loudspeakers regularly spaced should be transferred to the central core. I could check this with my own computerized medium without any surprise, because it is simply the Huygens Principle. It should be emphasized that a chain reaction occurs. The reactive product, which is heat, causes additional reactions to take place, making the standing wave system oscillate permanently. Fortunately, the system cannot overheat and explode because the reaction is limited to the core. On the Internet since September 2002. Last update October 7, 2007.